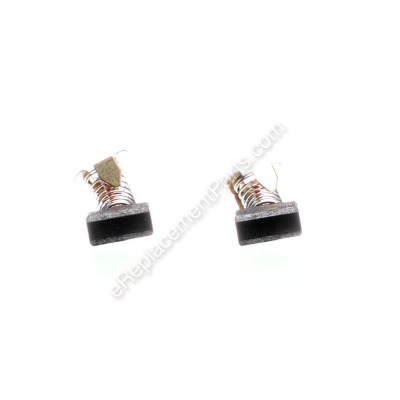 *This part replaces obsolete part #: 194986-9, 181047-4, 643152-0, 643153-8, 957805410 and 643154-6. I bought a used miter saw it was working great,some sparking from the motor down towards the cutting head inside the motor housing. One minute it was working then nothing. What would be the cause? Hello Brian, thank you for your question. I would recommend checking the brushes and brush caps. It sounds like the need to be replaced. I hope this helps! I have a bit that is stuck and I can't get it out of the collect. I also can't find my wrench's or owners manusl. Hi Richard, Thank you for your question. If the stuck bit is not coming out of the collet try a few drops of WD-40 or Liquid Wrench and let it seep into the collet around the bit shank. Next, hold the spindle with a wrench or spindle lock and then, with a thick work glove on your other hand, grab the bit and twist back and forth until it is free. Also, here is a link to your owner's manual that you may reference, https://www.manualslib.com/manual/649103/Makita-3601b.html. I hope this helps. Thank you and have a great day! Circular just would not start. I bought a used Makita circular saw(barely used) but it wouldn't start. So I took out the brush caps. The brushes were stuck due to corrosion..pry/pulled them out and install new ones....works like new....thanks for the parts. The old brushes had about 1/3 of their original length. I removed brush caps with a screwdriver, then used some forceps to remove the worn brushes. Installed the new brushes into the brush holder, then replaced the brush caps. I have used the planer for over 40 years without any problems other than feed roller replacement. 3. Plugged in the saw and it worked like a charm! This is on a Makita 3612BR router that was given to me. Checked the brushes, one was wore and the other was gone. Just had to remove the brush caps and clean out the brush holders, then insert the new brushes and screw the brush caps back on. There were some other things wrong like the cord was shot, easy enough to replace. Some one replaced some of the screws with SAE screws instead of METRIC, that was a small fix, tap and die set to the rescue. A good cleaning and it works great. Replaced with the new brushes. Easy! Table saw would not turn on. 2. Take a close-up picture of electrical connections with cell phone, unplug old switch. 4. Replace switch cover. done. 5. Use key punch to carefully remove old broken plastic handle. 6. Install new handle, use 'small' hammer to tap in key. 7. Had to find a screw for tightener as mine was gone and was not included with new handle. done. 8. Removed old carbon brushes, they still had half of their original length, so I used an air hose to blow off any sawdust and put them back in. done. Did not install the new ones, not needed, will save for future use. Saw works just fine now. 1. Pulled out the Switch Button and put in the new. 2. Unscrewed the plastic buttons that holds the Carbon Brushes (2 each) and installed the new brushes. 3. Tried running it...came on immediately. Removed old lever and put new one on. Removed worn brushes and put new ones in. Checked brushes and they were worn down. I was please to be able to find brushes for my 35 year old Makita 10 inch miter saw. Installed new brushes and it works like new again. The old brushes were seize into the armature. I did not want to take the armature out of the saw housing. Took a dremel tool and sawed out small holes in the side of the saw where the saw vents are located. Took a small jeweler screwdriver and tap the brushes thru the holes created.. This loosed the old brushes. I made sure everything was cleaned of all carbon. Installed new carbon brushes. Saw now screams like a new one. If your saw is under warranty, I would not do this. My saw was old and I had nothing to lose.